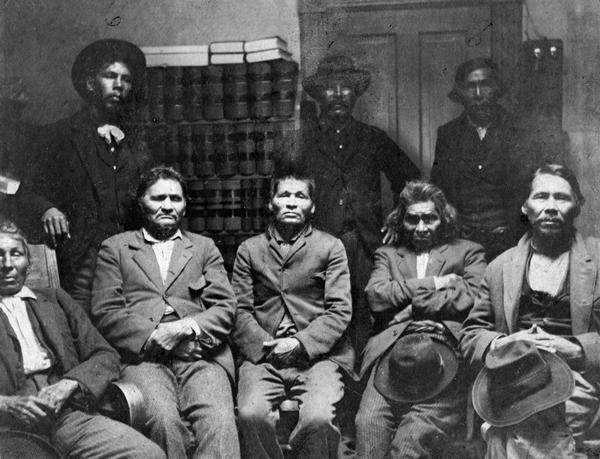 A group of locally important Potawatomi Indians, apparently photographed in a government or law office at Escanaba, Michigan. Left to right standing are Fred Jones Wanka, Joe Negahnee, and Wis-Ki-Ge-Amatyuk, also known as John Buckshot (Prairie Band Potawatomi, Kansas, principle pipe carrier and ritual leader). Seated left to right are Joseph Waumegesake (or Wampum, a descendent of the older chief Wampum, born in Manitowoc), Abraham Michicot (or Mishegand, who was born at Mink River in Door County), David Nsa-waw-quet (or Crutch, reportedly the best hunter and trapper in Michigan), Ben Ah-quee-wee (Dr. Ben), and William Keeshik of the Manitowoc band. For further information about the careers and family relations of these men see the Dr. Alphonse Gerend collection, PH 6176. This image is part of an exhibit about Native Americans prepared by Paul Vanderbilt, the Wisconsin Historical Society's first curator of photography.